Located in the space between the distal femur and the tibial plateau, the elastic crescent-shaped menisci (the medial meniscus and the lateral meniscus) play a number of important roles in the proper functioning of the knee. Their remarkable physical properties enable them to function as shock absorbers between the weight bearing surfaces of the knee and distribute compressive forces from the femur more evenly across the tibial plateau. The role of the menisci is so important, as without this distribution of weight, the knee joint would be exposed to loads of up to six times greater. The menisci also help to lubricate the sensitive cartilage surfaces between the tibia and femur. In addition, due to the firm attachment of their thicker outer portions to the joint capsule, they play an important part in overall joint stability. The most common meniscus injuries are tears, including incomplete and complete tears. The cause of these tears may be either acute (resulting from injury) or degenerative (part of the natural aging process). Given that meniscus injuries can impede joint function and lead to potentially irreversible joint damage such as osteoarthritis, it is essential to consult a doctor immediately in cases of suspected injury. Only an experienced orthopedic specialist is able to determine if a meniscal tear is likely to heal on its own, or requires surgery. The pain associated with a torn meniscus, will reliably let you know that there is a problem with your knee. You may experience a shooting pain when rotating your knee or when standing up from a squatting position. Sudden stabbing pain of this sort occurs most often in cases of accident or sports-related injury to the meniscus. A sudden loss in the range of motion of the knee, or in the weight-bearing ability, may also point to an acute meniscus injury. A painful inability to extend the leg, or a snapping sound, is often an indication of a particular tear known as a bucket-handle tear. Degenerative processes, which are characterised by diffuse, sporadic or gradually increasing levels of pain and discomfort in the knee, are much more troublesome than acute injuries. These may also be accompanied by a build up of fluid and heat, as well as knee pain that increases throughout the day. Even minor events such as an awkward movement, can trigger a rupture in meniscal tissue which can lead to significant degeneration. When is surgery necessary for a meniscus tear? Surgery is not always necessary for a torn meniscus. 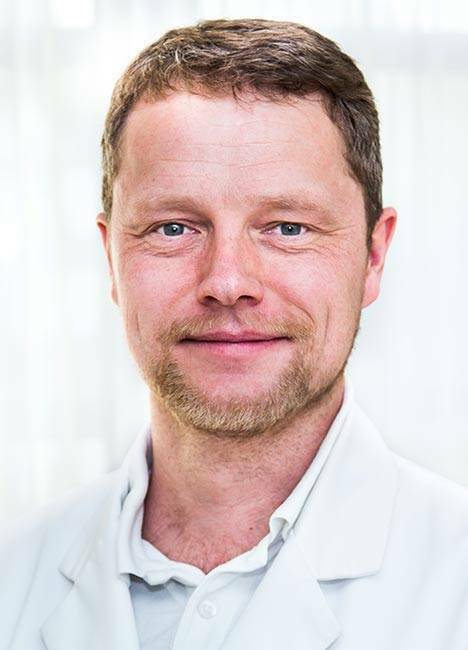 The chances of self-healing may be very good, depending on the type and location of the tear, as well as the age of the patient and the general condition of the tissue. Sports-related meniscal tears in young patients, who have good tissue quality, stand a particularly good chance of healing completely. The chances of spontaneous healing are also good when the tear is in the outer third of the meniscus, because the supply of blood is better at or near the outer edge. In all of the cases outlined above, physical therapy will speed up the healing process. By contrast, there is almost no chance of spontaneous healing in the case of degenerative meniscus tears. Depending on the degree of pain involved and the degree to which the range of motion is reduced, it may be advisable to follow a conservative form of treatment, as a means of delaying surgery. However, this will not eliminate the cause and could result in an asymptomatic patient waiting too long (when secondary damage has already been occurred) before starting further treatment. As a precaution in such cases, arthroscopic surgery might be recommended, in order to get a better look at the condition of the joint cartilage. Better long term outcomes often depend on early diagnosis and early treatment. The aim of arthroscopic surgery is to conserve as much of the natural meniscal tissue as possible, in order to optimise the long-term functional capacity of the joint. In the case of some degenerative injuries, it may be necessary to remove part of the meniscus, but the surgeon will remove as little functional meniscal tissue as possible, so as to help ensure better long-term prospects. What types of meniscus surgery are performed? A tear in an otherwise healthy meniscus, especially a tear near the outer edge of the meniscus where the blood supply is sufficient, is best repaired using sutures. The special sutures and modern suturing techniques used during arthroscopic surgery, permit excellent patient outcomes. Having assessed the size and the location of the tear, an experienced surgeon will make a decision as to which suturing technique is the most appropriate. Even in the case of relatively serious and large bucket-handle tears, it is important to conserve as much of the meniscus as possible, so as to limit the risk of osteoarthritis in the future. Meniscal repair is generally followed by an approximately four week phase of protective weight bearing with the aid of crutches. The transition to full weight bearing begins in the fifth week. Patients will be expected to wait for a period of six to eight weeks before beginning to play low stress sports and six months before playing sports involving greater levels of stress to the knee. A partial Menisectomy is performed using a minimally invasive arthroscopic technique. It may performed under local or general anaesthetic. The procedure is designed to remove the damaged portion of the meniscus (the layer of cartilage on top of the tibia that cushions and stabilises the knee joint). First the knee area is cleaned and sterilised. Next the surgeon creates between two and five small incisions in the knee. 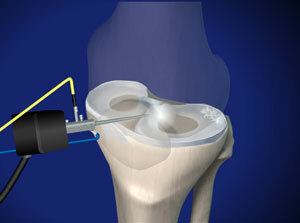 An arthroscopic camera is then inserted into the area so that the surgeon can evaluate the cartilage and ligaments. The other incisions will be used as access points for the other arthroscopic tools. The surgeon cuts or shaves away the torn pieces of the meniscus, preserving as much of the healthy tissue as possible. The edges of the area are cleaned and smoothed and the rest of the joint inspected for damage. Once the surgical instruments have been removed, the incisions are closed with sutures or surgical staples and the knee is bandaged. What happens after a partial menisectomy? Rehabilitation following a partial menisectomy varies depending on the the patient and the severity of the injury that has been treated. After simple resectioning of a meniscus, patients will be allowed to move about on crutches on the same day as the surgery is performed. These patients are usually able to return to work after one to two weeks, unless their work involves higher than normal levels of stress for the knee. A rehabilitation plan will normally include specific exercises to strengthen the joint. With a proper degree of caution, patients are permitted to begin taking part in "low stress" sports such as cycling after one week. Swimming may be considered only after the wound has healed completely. Sports that are typically more stressful for the knee such as football, tennis and basketball, are usually only advised after three to four weeks.